Denis and Cathal Brosnan’s Croom House Stud has built up a tremendous reputation over a number of years now for the quality of horses bred there, and also for many notable foal purchases that have gone on to reap rich dividends as yearlings. 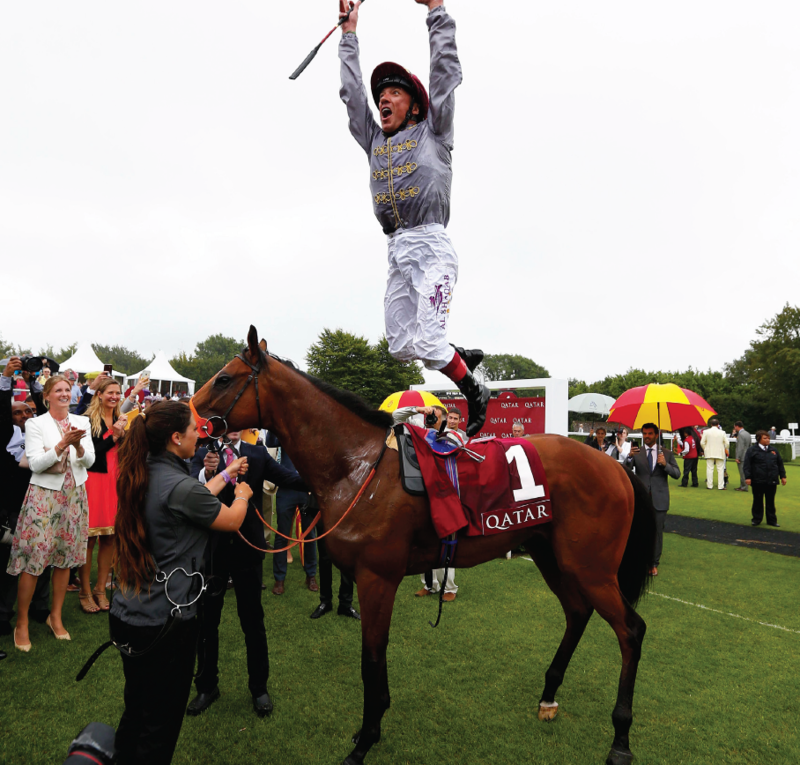 At Glorious Goodwood the Brosnan’s Epona Bloodstock was twice in celebratory mood, following victories for Mehmas in the Group 2 Qatar Richmond Stakes and for California in the Group 3 fillies’ race. They bred both winners, the latter in partnership with the late Patsy Byrne. Mehmas was an appropriate winner in the colours of Al Shaqab Racing and he beat a small but quality field. It would be no surprise to find that the colt will be aimed solely now at Group 1 juvenile contests and is snapped up for early stud duties. He is a pure two-year-old type. Brosnan sold him as a yearling for 62,000gns to Church Farm and he reappeared in the Tattersalls ring this year at the Craven Breeze Up Sale and left plenty of profit in the pockets of his pinhookers, selling this time to Peter and Ross Doyle Bloodstock for 170,000gns. He has shown by now that this was a bargain and his earnings alone stand at £240,000 or thereabouts. Contrast this investment with that made by Sheikh Hamdan in Mehmas’ year older full-brother Yasood. Another produce of the mating of Acclamation with the unraced Machiavellian mare Lucina, Yasood caught the eye as a yearling and realised 300,000gns. He started four times for Dermot Weld without appearing likely to even get placed, and was sold on at the Tattersalls July Sale this year for a mere 1,200gns. Lucina was the only one of her dam’s 15 foals not to race. She produced 10 winning offspring and the triple Group 3 winner Blue Monday was the best of these, He won eight times in all and was placed in the Group 1 Juddmonte International and the Coral Eclipse Stakes. A son of Darshaan, his Cape Cross half-brother Rugged Cross was a listed winner in Australia. 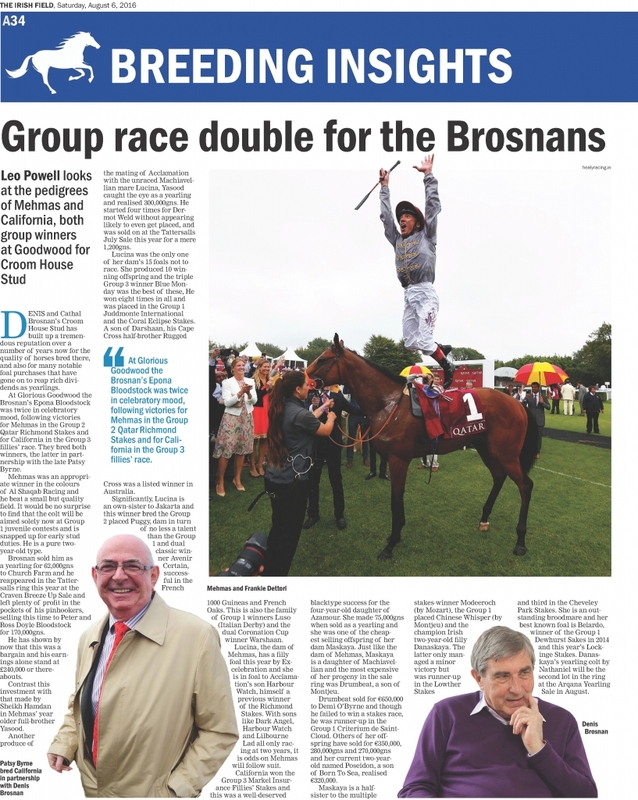 At Glorious Goodwood the Brosnan’s Epona Bloodstock was twice in celebratory mood, following victories for Mehmas in the Group 2 Qatar Richmond Stakes and for California in the Group 3 fillies’ race. Significantly, Lucina is an own-sister to Jakarta and this winner bred the Group 2 placed Puggy, dam in turn of no less a talent than the Group 1 and dual classic winner Avenir Certain, successful in the French 1000 Guineas and French Oaks. This is also the family of Group 1 winners Luso (Italian Derby) and the dual Coronation Cup winner Warshaan. Lucina, the dam of Mehmas, has a filly foal this year by Excelebration and she is in foal to Acclamation’s son Harbour Watch, himself a previous winner of the Richmond Stakes. With sons like Dark Angel, Harbour Watch and Lilbourne Lad all only racing at two years, it is odds-on Mehmas will follow suit. California won the Group 3 Markel Insurance Fillies’ Stakes and this was a well-deserved blacktype success for the four-year-old daughter of Azamour. She made 75,000gns when sold as a yearling and she was one of the cheapest selling offspring of her dam Maskaya. Just like the dam of Mehmas, Maskaya is a daughter of Machiavellian and the most expensive of her progeny in the sale ring was Drumbeat, a son of Montjeu. Drumbeat sold for €650,000 to Demi O’Byrne and though he failed to win a stakes race, he was runner-up in the Group 1 Criterium de Saint-Cloud. Others of her offspring have sold for €350,000, 280,000gns and 270,000gns and her current two-year-old named Poseidon, a son of Born To Sea, realised €320,000. Maskaya is a half-sister to the multiple stakes-winner Modeeroch (by Mozart), the Group 1 placed Chinese Whisper (by Montjeu) and the champion Irish two-year-old filly Danaskaya. The latter only managed a minor victory but was runner-up in the Lowther Stakes and third in the Cheveley Park Stakes. She is an outstanding broodmare and her best known foal is Belardo, winner of the Group 1 Dewhurst Sakes in 2014 and this year’s Lockinge Stakes. Danaskaya’s yearling colt by Nathaniel will be the second lot in the ring at the Arqana Yearling Sale in August.